We live in Dubai on the Arabian Peninsula, one of the hottest and most arid places on earth. Temperatures go up to 50C/120F in summer. The annual rain does not extend 20cm/7inches. It's desert. In the past, this region was not highly populated, apart from cities near the sea due to better access. Recently, I read an interview with the CEO of an Dubai-based Organic supermarket. He claims the carbon footprint is smaller if organic produce is imported from overseas than growing organic produce locally, as the water used is desalinated which comes at a very big ecological price. In fact, all water we use here is desalinated: when I bath, when I wash my dishes and clothes, when I water my garden. In fact, any green spot in Dubai is green because it is irrigated. Irrigated with desalinated water. We have the air conditioner running 24/7 for at least 6 months per year. Public buildings are probably air-conditioned all year round. The carbon footprint of the residents in the United Arab Emirates is one, if not THE highest in the world. I have no knowledge of the exact carbon-footprint related numbers of imported and local produce. Both alternatives feel wrong to me. If I step a few steps back and look at the region, the climate and the original population, I come to the conclusion that this part of the world was not meant to be populated by so many people as live here now. Only half a century ago, natural oil and gas resources were discovered that are now exploited by men. With the exploitation, the wealth came. Whole economies are built on it. Whole countries live off it. And they can afford, at least from a monetary point of view, to accommodate hundreds of thousands of expats living in these countries. In Saudi Arabia, 20% of the population are expats. Here in the UAE it's almost 90%. This means, nine times more people need to be fed, housed and transported. It's not natural, in the very literal sense of the word. My only conclusion is a very drastic one: to be ecologically responsible, one shouldn't live here, at least not with the lifestyle that we are currently leading. What are we contributing that would justify the damage? We have been living here for 7 years, both my kids were born here.... Food for thought. We have always been gardening in our little garden, more or less for the kids. They love to sow the seeds, check the following days if they had sprouted over night, get all excited when flowers blossomed, or when the first tomato could be harvested. Last year we planted some rocket seeds. It now grows like weed in my garden. Neighbors come over and pick whenever they need some arugula. I made pesto out of it. Now summer is approaching fast, and I still have an abundance of arugula. Before it dies in the heat, I am trying to use it as much as I can. 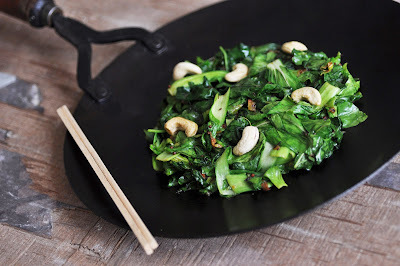 Ever since my second pregnancy (I know this is very unusual) I have been addicted to green leafy vegetables. I crave the bitterness that comes with it. My latest favorite use is the sauteed version. It's spiced with cumin, mustard seeds, cayenne and a little tomato, and sprinkled with sweet roasted cashews. Healthy, hearty, heavenly. A good side dish for any roast meat or if you you want to keep it vegetarian, on top of brown rice. Place cashews on baking sheet and roast for 3-5 minutes, or until lightly golden. Set aside. Heat the nut oil in a large pan over medium high heat. Add cumin seeds and let sizzle for 30 seconds to a minute while stirring. Stir in diced/pureed tomato, mustard seeds, turmeric, cayenne pepper and salt. Reduce heat, cover with lid and cook for about 5 minutes. Add water and bring to a boil. Reduce heat again and let simmer on low heat to reduce. Add the greens and cook until wilted, stirring regularly, about 2-3 minutes. 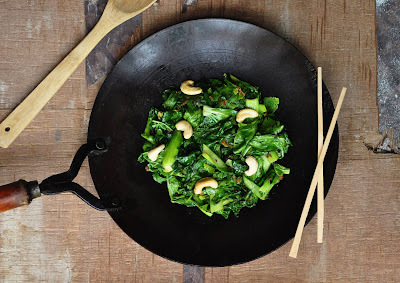 Transfer greens to serving bowl and sprinkle with roasted cashews. Serve immediately.